Plants From Prunings – More Autumn Jobs! Autumn is starting to settle on southern Tasmania. The days are now noticeably shorter, the chickens are laying a few less eggs and we’re preparing for a cold change overnight and a major rain event in the next 24 hours. Fingers crossed, this will fall where it’s needed, fill all our tanks and not do too much damage! I’ve been run off my feet trying to get as many winter vegetables ready and planted out before it gets really cold but I remembered this morning to keep up with the autumn cuttings! 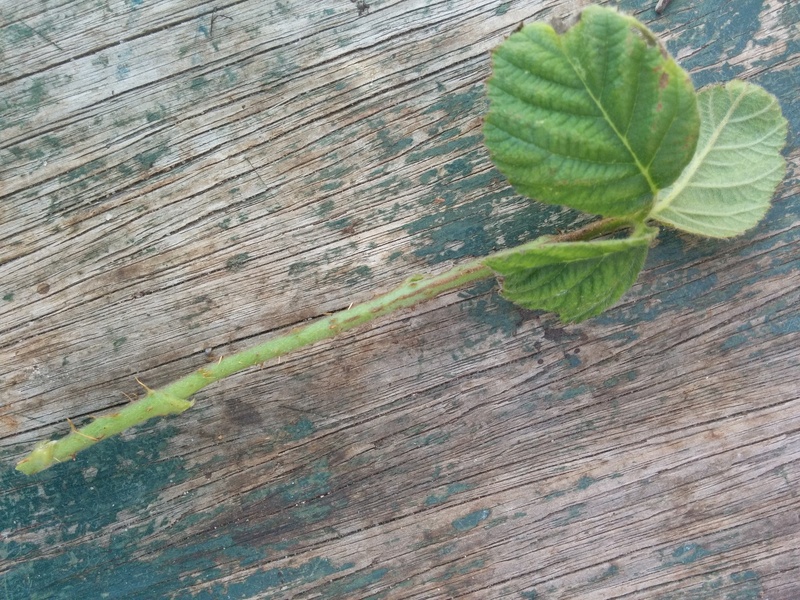 There are three main types of stem cuttings that generally fall into different parts of the year – softwood in spring and summer, semi-hardwood in late summer and autumn and hardwood in late autumn and winter (after leaf drop). A couple of weeks ago I pruned and thinned out my two Blueberry plants (Vaccinium sp.) that currently live in two tubs. 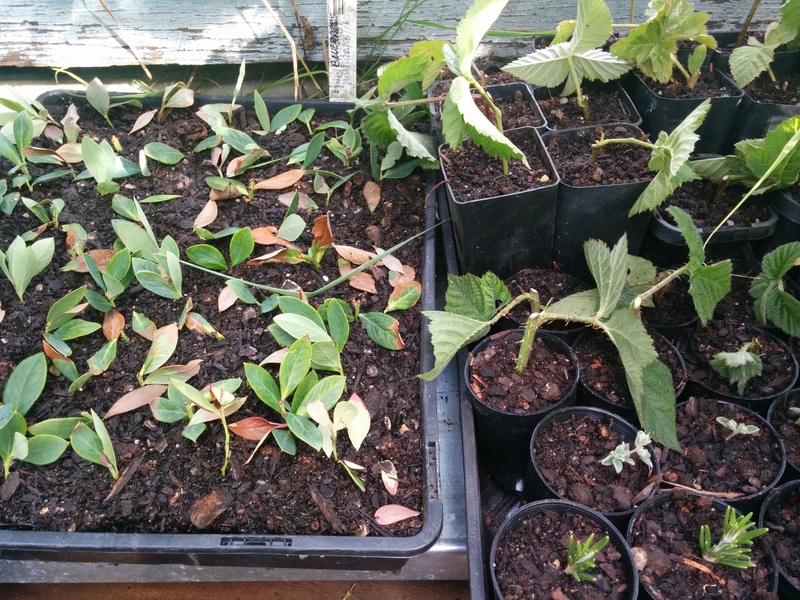 They produced over a kilo of fruit this summer so, in an effort to improve on this crop, I planted approximately 60 small cuttings directly into a nursery flat (tray). Hopefully, I’ll have enough young plants from this to put in a hedge of Blueberries and some to give away to family as presents next xmas. 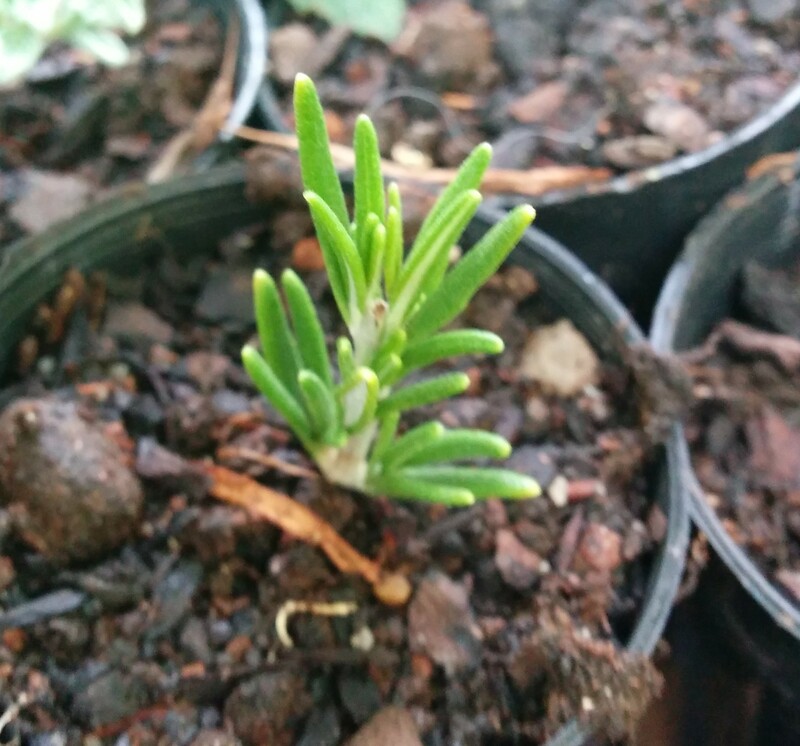 Many people I know, even experienced gardeners, seem to be a little shy about propagating plants from cuttings but once you know what to look for, it’s really quite fun, can save a lot of money and provide gifts for other gardening friends and family. This is also called striking or asexual propagation, and is a much faster way to get new perennials than growing from seed. Unlike seed raising though, there is no genetic diversity – we are taking a piece of the plant, putting it in a growing medium and encouraging the piece to form roots and grow. Some plants strike more readily than others. For instance, Bay (Laurus nobilis) and many of the most beautiful Australian natives can be notoriously difficult even for the experienced, whereas plants like Sage (Salvia officinalis), the Rosemary forms (Rosmarinus sp.) and even Lavenders (Lavandula sp.) can be really quite easy. The big secret to success is before starting, make sure everything is really clean – the pots or trays you want to use, secateurs (and make sure they’re sharp! ), the surface you’re working on and of course, your hands. By the way, because of the spines I wore gloves when doing the berry cuttings and made sure they were very clean too. I use a good quality seed raising mix and usually fill the pots and/or trays with the mix and water it before starting doing the cuttings. And make sure you have labels, a marker or pencil and a something clean to make holes in the mix – this has the delightful name of a “dibble stick”. I use a pH tester that lives in the greenhouse – the metal rod is the perfect size for this job. Today I did a mixed tray of my favourite Boysenberry, Youngberry and Silvanberry that needed pruning, some very special Lebanese Oregano or Za’atar Leaf (Oreganum syriacum) and my favourite Rosemary form (Rosmarinus officinalis ‘Tuscan Blue’). Because I was using a mix of pots today, I took a mix of cutting lengths to suit. I start by filling the pots, watering them and using the dibble stick to make a hole in each pot. 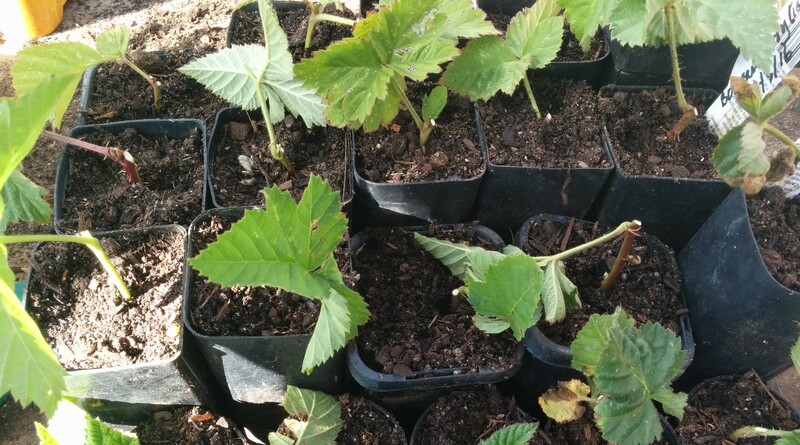 Then I went out and trimmed back the first plant I wanted to propagate, the Boysenberry. Sometimes, if the top leaves are particularly big they might need to be clipped in half too. Carefully put the cutting into a prepared pot and very gently press the soil around the stem. Continue until you’ve got what you need, label immediately and water lightly – a mist bottle is great for this! This time of the year when there’s still some warmth in the sun, I leave them in a mostly shady spot in the greenhouse, down the bottom of one of my shelves. You can create a mini greenhouse, using a plastic bag with a few holes poked in it if you’re doing a tray inside. Do you propagate your own plants? What are your top tips for success and best plants? Leave a comment below. I am sitting here at 6.30 in the morning reading this post and it’s raining outside. I never thought that the simple act of precipitation on a tin roof would make me so happy. Do your blueberry cuttings strike well? We have some ancient old blueberries that we inherited from someone a few years ago that we are going to dig out and rehouse this year and I was thinking about taking cuttings from them to see if we can’t get some additional life out of them. I might have a go at taking some cuttings from my berries as well after reading this. I took some cuttings from a (kind) lady who was moving away’s jostaberries and blackberries and almost every single cutting struck. I am thinking of putting in a currant/jostaberry hedge and if it wasn’t for our local possum infestation, I would go through with it. I might just hedge the outer perimeter of Sanctuary (fully enclosed veggie garden) with them to fortify it and make the most of them. Cheers for another excellent blog post full of potential. I am so glad I found this blog, it’s also an excellent reminder of when to get cracking in the garden. Thanks! And a blueberry post would have us salivating! I was laying in bed at 6.30am asleep, but not long after I awoke to contemplate the rainy day 😀 Great blog topic and very timely Debra! I’m such a novice I needed this info. Will give cuttings a try again (even my rosemary didn’t strike!) when I have fodder to strike. I had been told it was ‘easy’ and just take a cutting and throw it in a pot with soil I used hormone solution too, but alas, only one heavy-duty branch of a climbing rose remains alive from my attempts. I’m looking to buy a couple of blueberry plants soon, so if you have any advice (or want to write a blueberry plant post) on that I’d be interested. I have noted that I’m interested in Denise or Joyblue for an early producing bush, Stanley or Herbert for mid season, and Dixi or Caroline for late, but when I looked yesterday I found many plants did not label the varieties. And the one that was labelled was Denise which seems to be everywhere. How do I get what I want? Hi Katara Jade, welcome to the party and thanks for your nice words. Yep, so many plants are ‘easy’ to strike but a lot of folks forget it’s only with practice we get a feel for what we’re trying to do. And I really think one of the biggest mistakes I’ve made too often over the years is forget to clean and sharpen the secateurs! Buying named varieties of anything is a risky prospect when going to most garden centres these days.Perhaps talk to commercial growers and see if they’re prepared to sell you some of their named varieties? PS: Hmmmmm – a Blueberry post could be interesting! Good reminder – I keep thinking I must have a break from painting the house ready to sell and get more cuttings of plants I want to take with me. Especially the thornless blackberry. I’ve found layering works with many plants that are tricky to grow from cuttings. It gives a cutting with roots already on it, what could be easier than that!